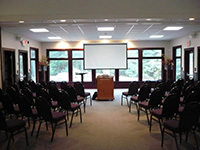 In the ancient tradition of Benedictine hospitality, the Glastonbury Abbey Conference Center offers a comfortable, light-filled venue for celebrations, meetings, and retreats. The tranquil beauty of its natural setting on the grounds of the historic Glastonbury Abbey in Hingham is a welcome respite from the city, yet it is only minutes away from Boston. If you are looking for something different for your next special event, corporate meeting, party, banquet, reception, or retreat, the Abbey Center offers a unique alternative. The Abbey's Benedictine monks extend their hospitality to create a serene setting that accommodates your needs. Set on more than 60 wooded acres in Hingham, the Abbey Center offers amenities away from the hustle and bustle of everyday life. The secluded, peaceful setting provides an environment where participants and coworkers can think and be creative. 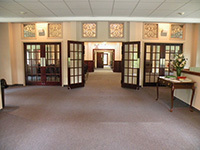 Whether looking for a place to communicate a simple message or somewhere unique to generate long range business planning, the Abbey Center is a place to foster great ideas. We will work with you to create a setting that will meet your particular needs and help you achieve your goals. Competitive rates are an added benefit to the unique surroundings at Glastonbury Abbey. "The natural beauty and serenity was a wonderful backdrop for our daughter's outdoor wedding and reception. We are still getting compliments! The Abbey was so helpful and accommodating. We couldn't have been more pleased."